WASHINGTON, D.C. — The U.S. Postal Service’s new stamps commemorating the Civil War 150th anniversary go on sale April 12. 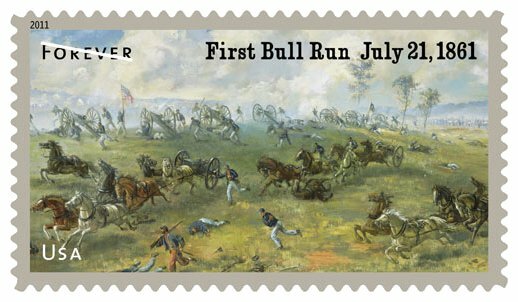 The stamps depict the start of the war and the first major battle. 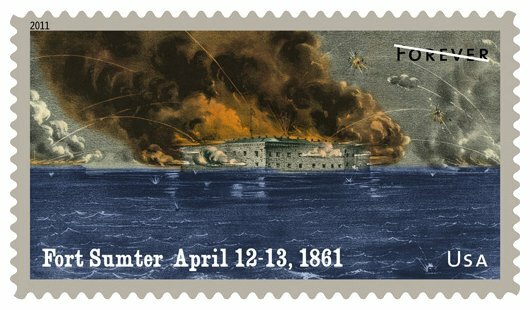 One stamp shows the Currier & Ives lithograph, “Bombardment of Fort Sumter, Charleston Harbor.” The other shows the 1964 Sidney E. King painting “The Capture of Rickett’s Battery” depicting fighting on Henry Hill during the Battle of First Bull Run at Manassas, Va. The series will feature two new stamps each anniversary year. The sheets, or panes, of stamps will include quotations and song lyrics. by Abner Doubleday, brevet Major-General, U.S.A.
As Senior captain of the 1st Regiment of United States Artillery, I had been stationed at Fort Moultrie, Charleston Harbor, two or three years previous to the outbreak of 1861. There were two other forts in the harbor. Of these, Fort Sumter was unoccupied, being in an unfinished state, while Castle Pinckney was in charge of a single ordnance sergeant. The garrison of Fort Moultrie consisted of 2 companies that had been reduced to 65 men, who with the band raised the number in the post to 73. Fort Moultrie had no strength; it was merely a sea battery. No one ever imagined it would be attacked by our own people; and if assailed by foreigners, it was supposed that an army of citizen-soldiery would be there to defend it. It was very low, the walls having about the height of an ordinary room. It was little more, in fact, than the old fort of Revolutionary time of which the father of Major Robert Anderson had been a defender. The sand had drifted from the sea against the wall, so that cows would actually scale the ramparts. In 1860 we applied to have the fort put in order, but the quartermaster-general, afterward the famous Joseph E. Johnston, said the matter did not pertain to his department. We were then apprehending trouble, for the signs of the times indicated that the South was drifting toward secession, though the Northern people could not be made to believe this, and regarded our representation to this effect as nonsense. I remember that at that time our engineer officer, Captain J. G. Foster, was alone, of the officers, in thinking there would be no trouble. We were commanded by a Northern man of advanced age, Colonel John L. Gardner, who had been wounded in the war of 1812 and had served with credit in Florida and Mexico. November 15th, 1860, Mr. Floyd, the Secretary of War, relieved him and put in command Major Robert Anderson of Kentucky, who was a regular officer. Floyd thought the new commander could be relied upon to carry out the Southern programme, but we never believed that Anderson took command with a knowledge of that programme or a desire that it should succeed. He simply obeyed orders; he had to obey or leave the army. Anderson was a Union man and, in the incipiency, was perfectly willing to chastise South Carolina in case she should attempt any revolutionary measures. His feeling as to coercion changed when he found that all the Southern States had joined South Carolina, for he looked upon the conquest of the South as hopeless. Soon after his arrival, which took place on the 21st of November ‘ Anderson wanted the sand removed from the walls of Moultrie, and urged that it be done. Suddenly the Secretary of War seemed to adopt this view. He pretended there was danger of war with England, with reference to Mexico, which was absurd; and under this pretext was seized with a sudden zeal to put the harbor of Charleston in condition-to be turned over to the Confederate forces. He appropriated $150,000 for Moultrie and $80,000 to finish Sumter. There was not much to be made out of Fort Moultrie, with all our efforts, because it was hardly defensible; but Major Anderson strove to strengthen it. He put up heavy gates to prevent Charleston secessionists from entering, and made a little man-hole through which visitors had to crawl in and out. We could get no additional ammunition, but Colonel Gardner had managed to procure a six months’ supply of food from the North before the trouble came. The Secretary of War would not let us have a man in the way of reinforcement, the plea being that reinforcements would irritate the people. The secessionists could hardly be restrained from attacking us, but the leaders kept them back, knowing that our workmen were laboring in their interests, at the expense of the United States. When Captain Truman Seymour was sent with a party to the United States arsenal in Charleston to get some friction primers and a little ammunition, a crowd interfered and drove his men back. It became evident, as I told Anderson, that we could not defend the fort, because the houses around us on Sullivan’s Island looked down into Moultrie, and could be occupied by our enemies. At last it was rumored that two thousand riflemen had been detailed to shoot us down from the tops of those houses. I proposed to anticipate the enemy and burn the dwellings, but Anderson would not take so decided a step at a time when the North did not believe there was going to be war. It was plain that the only thing to be done was to slip over the water to Fort Sumter, but Anderson said he had been assigned to Fort Moultrie, and that he must stay there. We were then in a very peculiar position. It was commonly believed that we would not be supported even by the North, as the Democrats had been bitterly opposed to the election of Lincoln; that at the first sign of war twenty thousand men in sympathy with the South would rise in New York. Moreover, the one to whom we soldiers always looked up as to a father-the Secretary of War, seemed to be devising arrangements to have us made away with. We believed that in the event of an outbreak from Charleston few of us would survive; but it did not greatly concern us, since that risk was merely a part of our business, and we intended to make the best fight we could. The officers, upon talking the matter over, thought they might control any demonstration at Charleston by throwing shells into the city from Castle Pinckney. But, with only sixty-four soldiers and a brass band, we could not detach any force in that direction. Finally, Captain Foster, who had misapprehended the whole situation, and who had orders to put both Moultrie and Sumter in perfect order, brought several hundred workmen from Baltimore. Unfortunately, these were nearly all in sympathy with the Charlestonians, many even wearing secession badges. Bands of secessionists were now patrolling near us by day and night. We were so worn out with guard-duty-watching them-that on one occasion my wife and Captain Seymour’s relieved us on guard, all that was needed being some one to give the alarm in case there was an attempt to break in. Foster thought that out of his several hundred workmen he could get a few Union men to drill at the guns as a garrison in Castle Pinckney, but they rebelled the moment they found they were expected to act as artillerists, and said that they were not there as warriors. It was said that when the enemy took possession of the castle, some of these workmen were hauled from under beds and from other hiding-places. When I asked Anderson for the wire, he said I should have a mile of it, with a peculiar smile that puzzled me for the moment. He then sent for Hall, the post quartermaster, bound him to secrecy, and told him to take three schooners and some barges which had been chartered for the purpose of taking the women and children and six months’ supply of provisions to Fort Johnson, opposite Charleston. He was instructed when the secession patrols should ask what this meant, to tell them we were sending off the families of the officers and men to the North because they were in the way. The excuse was plausible, and no one interfered. We were so closely watched that we could make no movement without demands being made as to the reason of it. On the day we left-the day after Christmas-Anderson gave up his own mess, and came to live with me as my guest. In the evening of that day I went to notify the major that tea was ready. Upon going to the parapet for that purpose, I found all the officers there, and noticed something strange in their manner. The problem was solved when Anderson walked up to me and said: “Captain, in twenty minutes you will leave this fort with your company for Fort Sumter.” The order was startling and unexpected, and I thought of the immediate hostilities of which the movement would be the occasion. I rushed over to my company quarters and informed my men, so that they might put on their knapsacks and have everything in readiness. This took about ten minutes. Then I went to my house, told my wife that there might be fighting, and that she must get out of the fort as soon as she could and take refuge behind the sand-hills. I put her trunks out of the sallyport, and she followed them. Then I started with my company to join Captain Seymour and his men. We had to go a quarter of a mile through the little town of Moultrieville to reach the point of embarkation. It was about sunset, the hour of the siesta, and fortunately the Charleston militia were taking their afternoon nap. We saw nobody, and soon reached a low line of sea-wall under which were hidden the boats in charge of the three engineers, for Lieutenants Snyder and Meade had been sent by Floyd to help Captain Foster do the work on the forts. The boats had been used in going back and forward in the work of construction, manned by ordinary workmen, who now vacated them for our use. Lieutenant Snyder said to me in a low tone: “Captain, those boats are for your men.” So saying, he started with his own party up the coast. When my thirty men were embarked I went straight for Fort Sumter. It was getting dusk. I made slow work in crossing over, for my men were not expert oarsmen. Soon I saw the lights of the secession guard-boat coming down on us. I told the men to take off their coats and cover up their muskets, and I threw my own coat open to conceal my buttons. I wished to give the impression that it was an officer in charge of laborers. The guardship stopped its paddles and inspected us in the gathering darkness, but concluded we were all right and passed on. My party was the first to reach Fort Sumter. We went up the steps of the wharf in the face of an excited band of secession workmen, some of whom were armed with pistols. One or two Union men among them cheered, but some of the others said angrily: “What are these soldiers doing here? What is the meaning of this?” Ordering my men to charge bayonets, we drove the workmen into the center of the fort. I took possession of the guard-room commanding the main entrance and placed sentinels. Twenty minutes after, Seymour arrived with the rest of the men. Meantime Anderson had crossed in one of the engineer boats. As soon as the troops were all in we fired a cannon, to give notice of our arrival to the quartermaster, who had anchored at Fort Johnson with the schooners carrying the women and children. He immediately sailed up to the wharf and landed his passengers and stores. Then the workmen of secession sympathies were sent aboard the schooners to be taken ashore. Lieutenant Jefferson C. Davis of my company had been left with a rearguard at Moultrie. These, with Captain Foster and Assistant-Surgeon Crawford, stood at loaded columbiads during our passage, with orders to fire upon the guard-boats and sink them if they tried to run us down. On withdrawing, the rear-guard spiked the guns of the fort, burned the gun-carriages on the front looking toward Sumter, and cut down the flag-staff. Mrs. Doubleday first took refuge at the house of the post sutler, and afterward with the family of Chaplain Harris, with whom she sought shelter behind the sand-hills. When all was quiet they paced the beach, anxiously watching Fort Sumter. Finding that the South Carolinians were ignorant of what had happened, we sent the boats back to procure additional supplies. The next morning Charleston was furious. Messengers were sent out to ring every door-bell and convey the news to every family. The governor sent two or three of his aides to demand that we return to Moultrie. Anderson replied in my hearing that he was a Southern man, but that he had been assigned to the defense of Charleston Harbor, and intended to defend it…. From December 26th until April 12th we busied ourselves in preparing for the expected attack, and our enemies did the same on all sides of us. Anderson apparently did not want reinforcements, and he shrank from civil war. He endured all kinds of hostile proceedings on the part of the secessionists, in the hope that Congress would make some compromise that would save slavery and the Union together. Soon after daylight on the 9th of January, with my glass I saw a large steamer pass the bar and enter the Morris Island Channel. It was the Star of the West, with reinforcements and supplies for us. When she came near the upper part of the island the secessionists fired a shot at her. I hastened to Major Anderson’s room, and was ordered by him to have the long roll beaten and to post the men at the barbette guns. By the time we reached the parapet the transport coming to our relief had approached so near that Moultrie opened fire. Major Anderson would not allow us to return the fire, so the transport turned about and steamed seaward. Anderson asked for an explanation of the firing from Governor Pickens, and announced that he would allow no vessel to pass within range of the guns of Sumter if the answer was unsatisfactory. Governor Pickens replied that he would renew the firing under like circumstances. I think Major Anderson had received an intimation that the Star of the West was coming, but did not believe it. He thought General Scott would send a man-of-war instead of a merchant vessel. Great secrecy was observed in loading her, but the purpose of the expedition got into the newspapers, and, of course, was telegraphed to Charleston. Bishop Stevens of the Methodist Church stated in a speech made by him on Memorial Day in the Academy of Music, New York, that he aimed the first gun against the Star of the West. I aimed the first gun on our side in reply to the attack on Fort Sumter…. We have not been in the habit of regarding the signal shell fired from Fort Johnson as the first gun of the conflict, although it was undoubtedly aimed at Fort Sumter. Edmund Ruffin of Virginia is usually credited with opening the attack by firing the first gun from the iron-clad battery on Morris Island. The ball from that gun struck the wall of the magazine where I was lying, penetrated the masonry, and burst very near my head. As the smoke of this explosion came in through the ventilators of the magazine, and as the floor was strewn with powder where the flannel cartridges had been filled, I thought for a moment the place was on fire. When it was fully light we took breakfast leisurely before going to the guns, our food consisting of pork and water. The first night after the bombardment we expected that the naval vessels outside would take advantage of the darkness to send a fleet of boats with reinforcements of men and supplies of provisions, and as it was altogether probable that the enemy would also improvise a fleet of small boats to meet those of the navy, it became an interesting question, in case parties came to us in this way, to decide whether we were admitting friends or enemies. However, the night passed quietly away without any demonstration. As the fire against us came from all directions, a shot from Sullivan’s Island struck near the lock of the magazine, and bent the copper door, so that all access to the few cartridges we had there was cut off. Just previous to this the officers had been engaged, amid a shower of shells, in vigorous efforts to cut away wood-work which was dangerously near the magazine. After the surrender we were allowed to salute our flag with a hundred guns before marching out, but it was very dangerous and difficult to do so; for, owing to the recent conflagration, there were fire and sparks all around the cannon, and it was not easy to find a safe place of deposit for the cartridges. It happened that some flakes of fire had entered the muzzle of one of the guns after it was sponged. Of course, when the gunner attempted to ram the cartridge down it exploded prematurely, killing Private Daniel Hough instantly, and setting fire to a pile of cartridges underneath, which also exploded, seriously wounding five men. Fifty guns were fired in the salute. With banners flying, and with drums beating “Yankee Doodle,” we marched on board the transport that was to take us to the steamship Baltic, which drew too much water to pass the bar and was anchored outside. We were soon on our way to New York. With the first shot against Sumter the whole North became united. Mobs went about New York and made every doubtful newspaper and private house display the Stars and Stripes. When we reached that city we had a royal reception, The streets were alive with banners. Our men and officers were seized and forced to ride on the shoulders of crowds wild with enthusiasm. When we purchased anything, merchants generally refused all compensation. Update at 10:12 a.m. 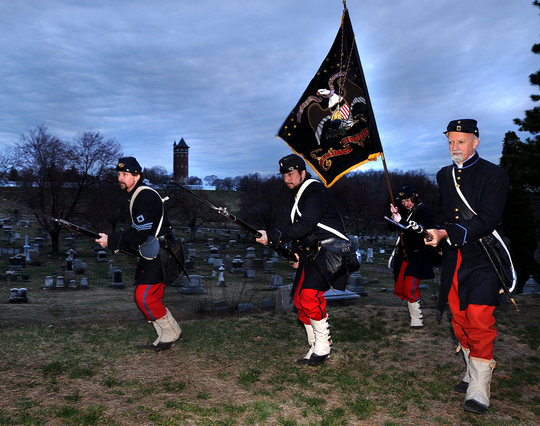 ET: Cannon roared today in Hartford, Conn., to mark the 150th anniversary of the outbreak of the bloody four-year war, The Hartford Courant reports, noting that 5,354 Connecticut men died in the conflict. Let it be forever remembered that the greatest crime committed since the crucifixion of our Saviour was wantonly and willfully committed in behalf of American Slavery! Earlier posting: The fiery blast from a lone mortar at 6:45 a.m. today near Fort Sumter marked the start of the Civil War 150 years ago and the beginning of a four-year commemoration of the conflict that cost 600,000 lives, The Post & Courier reports. The mortar round on a grassy point near Fort Johnson in South Carolina triggered a bombardment of cannons lining the harbor toward Fort Sumter, which Union troops held April 12, 1861. A “star shell” was also fired into the sky today, signaling re-enactors who have been encamped in the Charleston area to begin reliving the attack that started the conflict. Cannon set up around the harbor will fire throughout the morning in recognition of the bombardment, the Charleston newspaper reports. 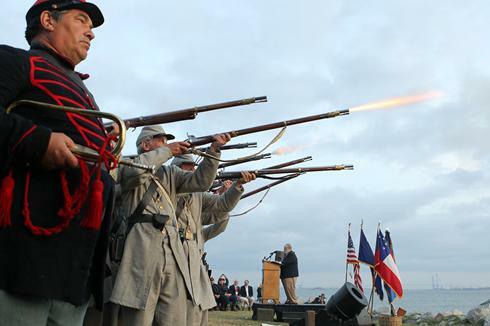 “This was history, again, in the making,” state Sen. Glen McConnell of Charleston, the main speaker at Fort Johnson, said of today’s ceremony. 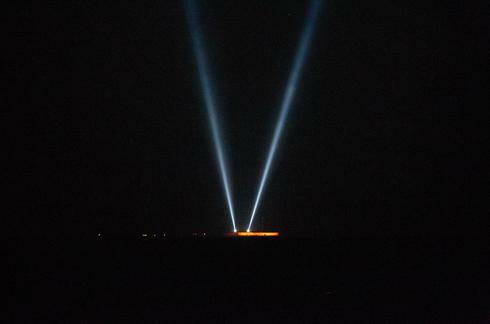 The stage was set for this morning’s events at 4 a.m. when a single beam of light reached skyward from Fort Sumter. About a half-hour later, there was a second beam signifying a nation torn in two. “The ball has opened. War is inaugurated … Fort Sumter has returned the fire, and brisk cannonading has been kept up,” the correspondent wrote.